Purchased by Henry Hoffman on March 13, 1907, the Hoffman-Stroh-Wynn barn wasn’t part of the original farm or farm activities. Hoffman began his long journey to Berthoud many years earlier though. He was born Oct. 9, 1873 in Frank, Russia, where he grew up and then married Marie Elizabeth Spieren on January 28, 1892. The couple left immediately for the United States, settling in Stratton, Neb., where Henry worked on the railroad and farmed, and they were active church members. The Hoffmans and their five children then joined six church families in a 1901 wagon train to Loveland, where Henry worked for the railroad and then rented a farm. The seven families initially met for worship each Sunday in their homes, later building their own church building in Loveland. 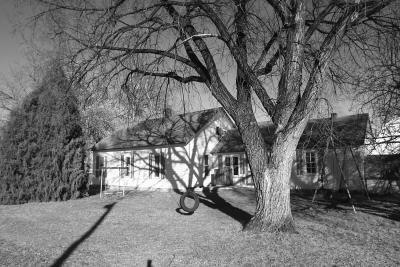 After the Hoffmans moved to the Berthoud farm in 1906, they continued to attend the Loveland church, traveling first by horse and carriage and later by car. Their six children were born in Colorado between 1902 and 1916. The beautiful barn was built sometime around 1920. Although the farm had earlier owners, the first occupants were William and Maria Lyon, who bought it in August 1903. They likely built the original house along with a couple of sheds. William Lyon was not a farmer though and had a more modern house constructed in Berthoud in March 1905. He engaged in the shoe, bakery, and grocery businesses after moving to Berthoud. Neighbor Maurice Haworth said Hoffman raised sugar beets, barley and wheat, milked cows, and fed Hereford beef cattle. He had irrigation water and over the years leased the oil rights to several oil companies. 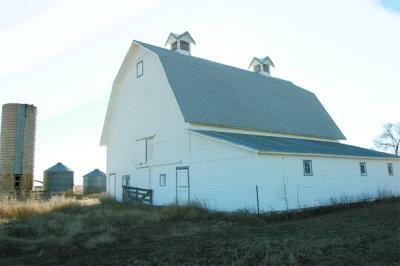 Hoffman paid for the Berthoud farm and then in the early 1920s he bought another farm near Loveland. He took out mortgages on both farms but by 1927 struggled to pay them. John Bunyan repossessed the farm in November 1932. Hoffman and his son continued to work the farm until January 1942, when Mrs. Hoffman died of a severe heart attack. Bunyan then sold the farm to bank cashier E. Lloyd and Alma T. Edwards, who never lived on the farm. Fred Hoffman, Henry’s son, farmed there until Edwards sold the farm to Reuben C. Stroh in 1948. In December 1962, Reuben Stroh sold the farm to Albert H. and Rose F. Mitze, whose son, George Mitze, farmed it until late 1964, when Chuck and Shirley Mitze Wynn took over, living there until 1990, purchasing it in the interim. The Wynns raised corn, alfalfa, Coors barley, and Black Angus cattle and they farrowed pigs for 4H. 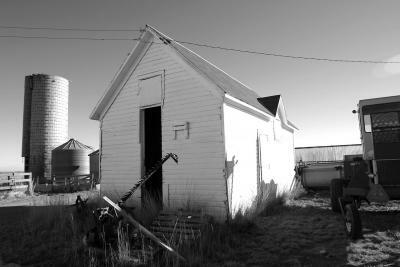 Located west of Berthoud, the Hoffman-Stroh-Wynn barn is a large gambrel-roofed structure with an attached shed. Two cross-gabled cupolas vent the barn roof, sliding doors open the center of each end of the barn and the west end of the attached shed and hinged doors sit in each corner of the ends of the barn. On the main floor, horse stalls once existed north of a central alley. A small pen is on the east end while a wall divides the alley from the southern area, which is divided into two rooms with concrete floors. One room was a milking parlor with stanchions and, later, farrowing pens. Refrigerated stainless steel tanks in the other room stored milk until it was picked up by the dairy. 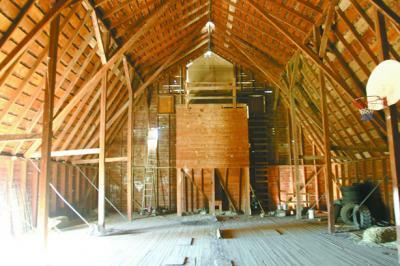 The barn’s loft is huge, rising 30 feet from floor to roof peak. An elaborate system of wooden and steel rod braces connecting each roof section to structural posts and the outer walls exists to prevent wind damage. Loose hay was lifted into the loft through the huge door using a hay hook pulled along a central rail. Beneath the hay door, two grain bins open through slide gates into the alley below. A basketball hoop, attached to one of the northern support posts, provided hours of fun for the Wynn boys. A south-facing roof opening allowed hay to drop from the loft into the corral below. Current owners Leland and Alice Asa purchased the farm in 1989 and 1992. They raise corn, alfalfa, and wheat. The barn has seen few modifications. The dairy rooms are now a shop, the loft staircase is gentler, and hardware cloth prevents the incursion of pigeons into the loft. A new roof and coat of paint demonstrate the Asas’ loving care for this historic property.